. . . and babies make four. : On the second day of Christmas . . .
Kenna and Michal love jewelery and in their opinion more really is better. They tend to choose hot pink, gold and lots of sparkles. They like to pile on five or six necklaces and an arm-full of bracelets. I, on the other hand, really like classic, simple jewelery and I especially like jewelery that is handmade. I found Amy Cornwell Designs when I was looking for a gift for a friend and immediately knew I'd found something special. Amy's jewelery is made of gold, sterling silver, gemstones, freshwater pearls and Swarovski crystals. Plus, most of her pieces are one-of-a-kind or customized in some way. Her jewelery is simply timeless . . . and very, very pretty. 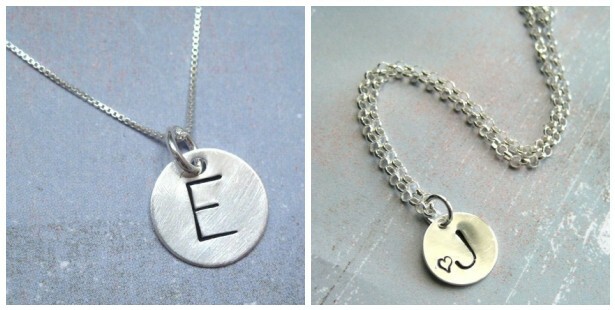 Amy is giving one lucky reader a darling sterling silver necklace with a hand-stamped charm. (Pictured below.) The winner may choose a 16- or 18-inch box or rollo necklace and they may also specify the letter for the 1/2" sterling silver disk charm. To enter this giveaway, please visit the Amy Cornwell Designs website and let me know which piece makes you smile. I especially like the Memories Necklace in the Heirloom Collection and the Amethyst Briolette Necklace! 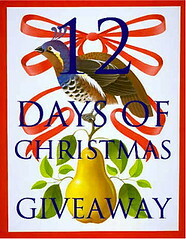 You may enter this giveaway until 12:00 midnight on December 8.
love the memories necklace. beautiful! I like the mini flower necklace. Very cute and simple ! Love the heirloom collection necklace, but it was a hard choice...all are beautiful! Her entire collection makes me smile, but I especially like the memories necklace and the mini bangle. Love the memories necklace. Can't wait to see what the next giveaway will be! Thank you again for holding the giveaways. Thank you for the link to her site. I love the elegance and simplicity of the Mini flower pendant. Thank you for entering my name. 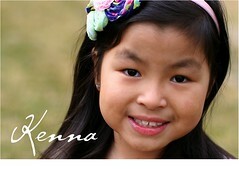 What beautiful things she has on her site! I especially like the grandmother's necklace and thought it would be a great gift for my mom from my kids!! Far better than a grandmother's mug!! There were quite a few pieces that made me smile but I really liked the grandmother's necklace. Would make a great gift for my mom from my girls. Much better than a granmother's mug!! The memories necklace is my favorite! Thanks Kristi! Happy Christmas to you and the fam! I love the heirloom memories necklace with the mixed metals! So pretty! All of these little gems make me smile though! The itty bitty bangle bracelet and the ID bracelet capture my attention! I have always been a sucker for ID bracelets and charm bracelets, so they appeal to me. Marissa is the SAME as Kenna and Michal! She loves hot pink and sparkly - the more, the better! Our tastes are so different and I love shopping with her. She make me look at things differently. Wow, these are all so beautiful! Thanks so much for doing this, it definitly opens my eyes to the many products there are out there if you just search a little! I would have to say the one that makes me smile alot is the mini bangle braclet. Even though I always seem to like necklaces more, I saw this one and my face just lit up! I love the itty bitty bangle bracelet and the breast cancer bracelet. Thank you for letting us know about Etsy and all the different items available for purchase. I was not aware of that site and find it hard to pull my self away from the computer to go to work...lol. 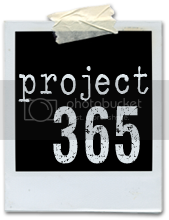 I love your blog and love to hear the wonderful and cute things that your girls do and say. 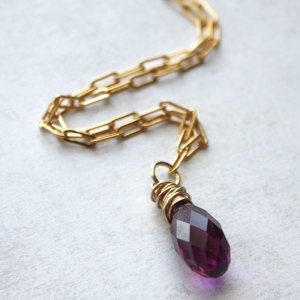 I love the briolette necklaces - I wonder if my children's birthstones would look good together... Thanks for sharing this find with us! The memories necklace is my favorite!!! The Memories necklace is SO unique and gorgeous! Everything is beautiful! Wow. So many beautiful pieces! I really like the school sports necklace since my son just made the high school basketball team. I also love the keys to my heart necklace. Thanks again for sharing! I love the grandmother's necklace in the Heirloom collection. 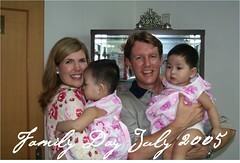 That could be because I'm Nana to two precious blessings from China! I really like the Lavender and Lime Watch. I would love to win this!! Wow...beautiful stuff! I think my favorite just might be the grandmonther's necklace, with the memories necklace being a close 2nd. Thanks for the link! Love the Heirloom necklace and the momories necklace. I love the Heirloom wedding necklace! The heirloom collection memories necklace is so unique! Thanks for sharing the jewelry. I love the Swimming Under the Sea bracelet! I love the Itty Bitty Bangle Bracelet. Darling jewelery designer! Some perfect gifts for wedding or baby showers. I love the Briolette necklaces...very chic! WOW! These giveaways are awesome!!! I love the mini square custom copper necklace. The copper looks unique with the silver. It's just the right size. I absolutely love the memories necklace! It is so beautiful!! I adore the ID style stamped bracelet! I agree, the memories necklace is especially nice. Hmmm . . . I think that the aquamarine briolette necklace might have to just be our gift this year to our children's very special godmother. I had thought I had found just "the" thing for her, but you have changed my mind!!! I was stuck for a gift for my sister, I'm thinking about the heirloom collection necklace now! But for me? I would probably like the memories necklace! I love the mini bangle bracelet, but everything is beautiful! Thanks for the chance to win! The Love necklace. I'm ordering it. Thanks for the site recommendation. Thanks for the links to all these great products during your giveaway! Lots of great, unique gift ideas. The mini long and short sterling charm bracelet makes my heart smile! Another beautiful giveaway! I love the memories necklace as well! Oooh - the Grandmother's necklace in the Heirloom collection. LOVE IT! 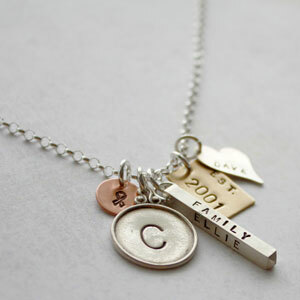 I really loved the Milestones Necklace...So cool and I could put all 5 of my kids' birthdays on there! oh wow! love the heirloom necklace! I love the heirloom memories necklace with the mixed metal. That is a stunning piece. Thanks Kristi you rock. I love the Mega square sterling necklace and the heirloom memories necklace -- I'm just following along with your 12 days of Christmas and accomplishing my Christmas shopping at the same time! Thanks for the tips. I love the mini bangle bracelet. Fun jewelry! I love the Aquamarine Briolette Necklace...my birthstone! WOW Kristi, I thought that choosing the bookplate was difficult. Hmmm, I really like the nales and last initial piece. I also like the charm that says I am blessed. I like the itty bitty bangle bracelet! I've been a fan of her etsy shop too. Oh boy! I spent a LONG time looking at all of the jewelry! I like lots of things, but the Mother's and Grandmother's necklaces in the heirloom collection keep calling me back! So beautiful! I love the initial necklace too! I love love love the Memories necklace. So beautiful.simply.gorgeous.delicious! I've shopped a few times at the vintage pearl, howvever this seller is a really nice alternative and has a great variety too. I especially love how she mixes the metals in her heirloom collection. However, what makes me smile is the mini bangle 'love' bracelet. The red stones just make it special and even Christmasy! Ah Christmas, I love this time of year. I wrapped all my pressies tonight while my daughter gorged on Candy Canes and we're feeling very in-the-spirit! I am in LOVE with the memories necklace. That is awesome. I must got back and get that for myself if I don't win!! Love this. Thanks for sharing. Oooo.. I know a certain little girl who would just love one of Mini Sterling Silver Word Necklace. So very simple but girlie! I love the Mega Sterling Washer Necklace! The Heirloom Memories Necklace is beautiful. It is a great way to keep your kids close! I clicked on the clearance section and was smacked with a memory. In my mother's jewlery box growing up (and its still there today) was a pearl ring that was my grandmother's. A simple classic band with seven or eight pearls clustard on top. I haven't thought of that ring in years. So I would have to say the Freshwater Pearl Cluster Ring was by far my favorite, even though it is not my normal style. What a fun giveaway! I love the stamped mini necklace! I like the puffy heart necklace! I love hearts! Love hand made medals... my favorite is the fancy raised edge square pendant in the misc stamped shape section. The Grandmother's Necklace - Heirloom Collection makes me smile BIG :-)! These keep getting better and better! I love heirloom collection. I love the Heirlooms Memories necklace too! The copper itty bitty necklace is the cutest little thing ever! WOW!! That is amazing!! I love the Aquamarine Briolette Necklace. Stunning! I love the memories necklace. Thanks for sharing your favorite things. The Memories Necklace is definitely my favorite! Adorable! I love the memories necklace. My favorite is the Mini bangle bracelet. It is gorgeous! I love the Heirloom Collection Memories necklace - the mix of different shapes makes it so unique. Thanks - I think ;)- for introducing all of these wonderful sites! 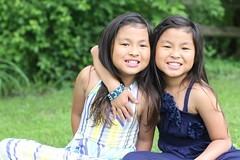 Love the E necklace featured on your blog! Would be perfect for me, lol BUT, I absolutely may have to get one of the stamped ID sterling silver bracelets. Would love being able to look down and my arm all day and see their names when I am away from my kids at work. They have some neat stuff there. I like the Itty Bitty Bangle Bracelet. Thanks for the heads up. I've never seen this site. The Bar Sterling Silver 1in Necklace - 4 sided made me smile - imagining all the possible combinations (but I'm thinking kids' and husband's name, possible the word "Love" or "Family"). beautiful. what a lovely necklace. I love the Breast Cancer Support Necklace 1. Just stunning! What a wonderful way to remember such an important cause. Even if I don't win anything, Thank you for doing this. You are intruducing all these new websites. Very cool! I think the memories necklace is my fav too! Love it all! I am ordering one of the Heirloom necklaces for my sister for Christmas - so that would be the one that puts a smile on my face! Great site, thanks. The Mini Sterling Silver Word Necklace made me smile. I love simple designs. I am in love with the wedding necklace! although I've been married for 13 years, I am in love with it! So simple and cute! Love the mini flower necklace and the custom word one. What a great gift idea! I really like the Love Memories Necklace in the Heirloom Collection. I love the Heirloom Collection Memories Necklace. There are so many beautiful pieces to choose from. I understand why this is one of your favorite sites. i love the copper itty bitty necklace! What a joy you are! I love the erinite briolette necklace. My favorite color! I love the heirloom love necklace...but really I love them all! I like the Love Necklace from the Heirloom Collection. I'm a sucker for earrings. I especially loved the opposites earrings in the New Oct. Items. The briolette necklaces are stunning and I loved the breast cancer support necklace 1. This would be wonderful for a family member who lost her older sister to breast cancer. All of her work is simply beautiful. My fav is the stamped ID style sterling silver bracelet. 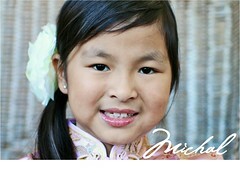 I am going to contact her and see if she can stamp my girls' Chinese names into them. Wouldn't that be cool! Mini bangle bracelet, but custom stamped - does she do that I wonder? I especially like the memories necklace. I totally love the heirloom collection "Memories" necklace!! And I had already decided what I wanted to put on it but now it's not on her website anymore! Ackkkk!! I like the simple Aquamarine Briolette Necklace. Very nice pieces. Likeso many, my fave is the memories necklace. What a fun giveaway. I really like all the items from Amy Cornwell. My favorite is the Gold Filled Mini Charm Bracelet.